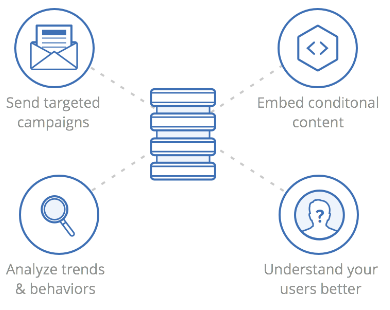 Create campaign automations, segments and more from their actions and behaviors. Simply add a small snippet of code to your website and instantly start tracking all of your site traffic. Our code can also allow you to log specific events using custom event calls from within mobile apps, custom backend services, billing apps, and more. We log every page your contacts visit, how many times they visit each page, and any custom events or actions that you desire. Perhaps you want to know if someone signed up for a form, watched a video, or downloaded a white-paper. You can log everything with minimal effort. Extend the tracking beyond web site interactions by using event logging. This allows you to log actions, changes, and more from within custom applications, backend services, mobile apps, and virtually anything else you wish to log. Personalize every aspect of your marketing. 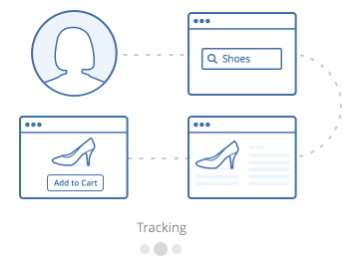 Take the data you collect from tracking and create highly effective campaign automations, utilize segments to explore your contacts, view a contact's full individual history, and send highly personalized campaigns and followups.